Sean Reid’s 67th minute header was enough to secure Spartans a vital away point at Brackley Town in a 1-1 draw. Reid rose highest from a Kieran Green corner to give Blyth the lead in an entertaining game at St James’ Park. Matt Lowe replied with a well taken finish seven minutes from time but Spartans held on to make it seven points from the last nine available away from home. 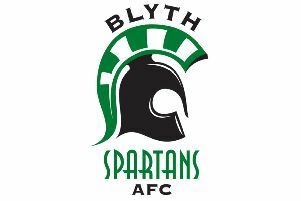 Spartans were forced into a number of changes from the side that suffered defeat at the hands of F.C. United of Manchester last weekend. Adam Wrightson and Jarrett Rivers missed out due to illness, with Kieran Green and Aaron Cunningham dropping to the bench. In came Jordan Watson, Lewis Horner and Sean Reid to the starting XI. An impeccable minutes silence was held in honour of those men and women who have given their lives in service, and remembering those who died in the First World War. There was very little goalmouth action in a cagey first half – Spartans working hard after their 248 mile trip to Northamptonshire – Sean Reid going closest with a low cross in first half injury time. And the other end, also in injury time, Peter Jameson saved well from Glenn Walker to keep parity at the break. The second half saw more action at both ends, but it was Spartans who broke the deadlock mid-way through the second half. Reid broke free from his marker to power a Green corner past Danny Lewis to the delight of the travelling Green Army. The lead was almost doubled when Dan Maguire had an effort on goal – the former Seaton Delaval striker beating the ‘keeper, but not the post. Brackley took their turn to rattle the woodwork, Lee Ndlovu cannoning an effort off the crossbar when through on goal. With seven minutes remaining, the hosts netted the equaliser. Jimmy Armson found Lowe in space before he finished potently to level proceedings. Maguire almost won all three points for the visitors deep into injury time, Lewis on hand to deny the England ‘C’ International.